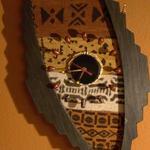 Most of the clocks in this section are available and ready to ship. Others can be special-ordered and will be noted as such. 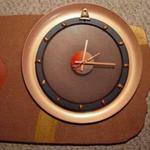 We do our best to replicate clocks shown in the photos when filling special orders, but remember, being individually handcrafted, each one is slightly different from the original. 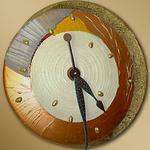 Please call us at 510.932.6085 or email us at steve@STEVENartclocks.com to confirm availability. We've given life to a cymbal beyond the hammering of a drumstick. 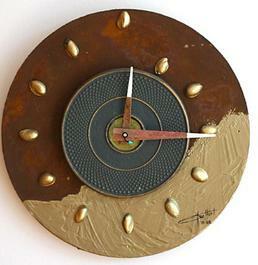 It's mated to a shaped and textured base with a unique matte gray finish with reflective specks and dimensional rust for a landscape effect. Glass circles add luminosity and depth, while a spiraling piece of steel evokes a hint of whimsy. Made from vintage, as well as not so vintage audio gear and pieces of glass with an illusionary film applied to give depth and luminosity. Thousands of dots were painstakingly painted one dot at a time over a period of several days. 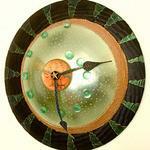 The centerpiece is a translucent disc with a butterfly wing, color-shifting effect. 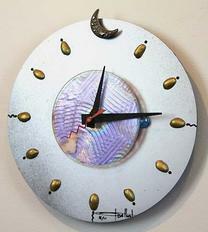 Textured hour and minute hands have an iridescent finish with glow in the dark accents. 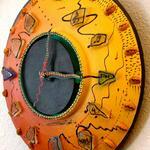 The second hand changes colors as it rotates. Very cool. Very hip! 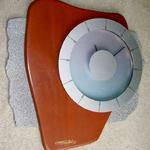 Made of meticulously cut wood, forming the base. 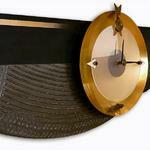 An off-round central piece is covered with cork that has voids, allowing a copper finish to peak through . 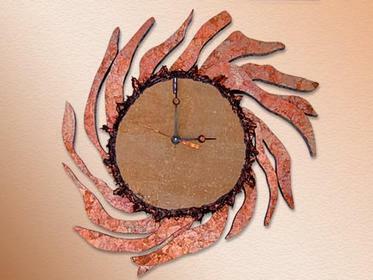 The "rays" are covered with a garnet-toned, metallic leaf finish. 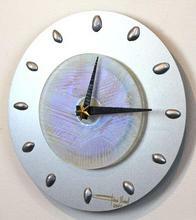 The lone 12:00 hour marker is an attractive piece of dichroic glass. A Jovi original. 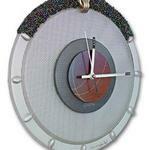 Made from re-purposed aluminum, recycled glass, jewelry and other found objects. 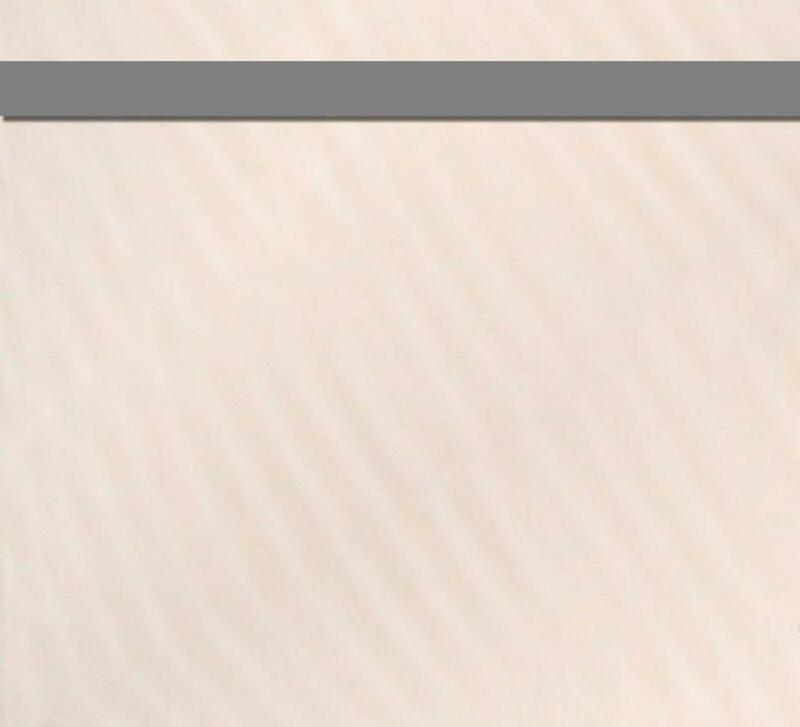 It's a real standout, literally. The two-inch gap between the face and base is filled with a material that resembles concrete, finished with a unique dark gray paint with glistening specks of mica. It's a free-spirited piece of art with a bodacious presence and an audacious attitude. 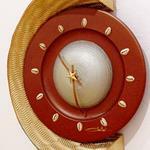 A look at the center of Moonrise will make you fall in love with it with its alluring, sensuous textures and colors. 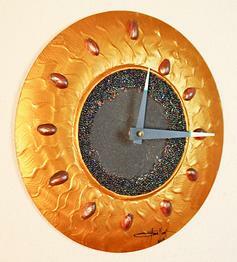 The base is a steel disc paired with pistachio shells with a gold finish. 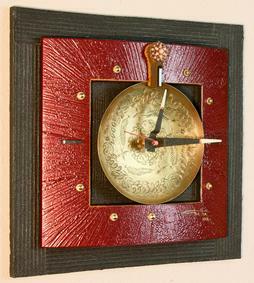 The hour and minute hands are uniquely shaped and are stepped down toward the base. The crescent moon at the 12:00 position gives a sense of connection to the universe. It's a very relaxing piece of art to look at. It's rough-hewn, earthy and elegant in it's simplicity. A speckled sand coating on the base level and gray, mica-infused texture on the top level form a contrast to the bright, gold hour markers and a jewelry piece marking the twelve o'clock spot. Using methods of light diffraction, the center of Silver Butterfly creates immediate impact with its color shifting effects. 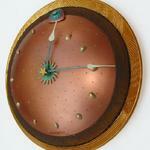 A revolving brass star at the center adds to the enchanted aura. 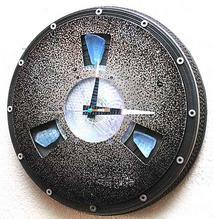 Made from two steel discs and a piece of waterjet-cut fiberboard that was textured and painted using a technique to create a deep, dimensional effect. 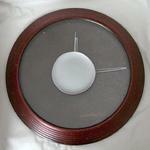 The rust effect on the base disc is a combination of faux rust and real rust on a textured base. 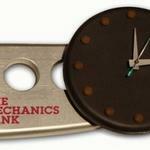 The hour and minute hands are covered with cork. 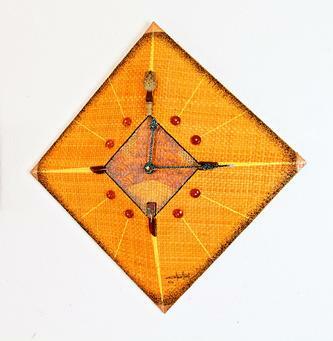 A STEVENart signature arrow counts the seconds. 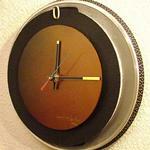 Made from recycled parts including a part from a gas range and a piece from an old G4 Macintosh. 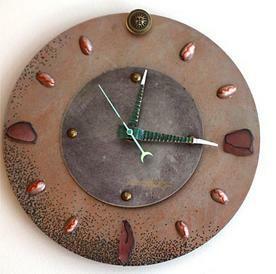 The heavily-textured, copper-finished surface has a real rust accent. The honeycomb-like texture at the center has a metallic, iridescent coating. Decorated hands follow the contour of the face. 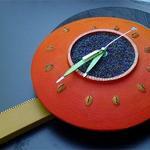 Made from a steel disc and a Japanese teapot holder, among other things, The hour and minute hands are covered with eucalyptus leaves. 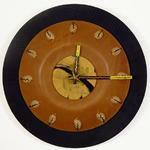 Counting off the seconds is a STEVENart signature arrow, while the hour markers spiral to the edge of the disc. 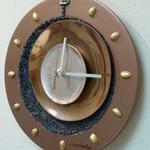 Made from a painted steel disc with painted dots, recycled glass, shells and a smiling brass sun at the 12:00 spot. 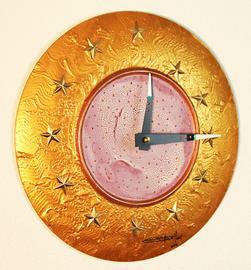 The hour and minute hands are textured and painted with a unique iridescent finish. 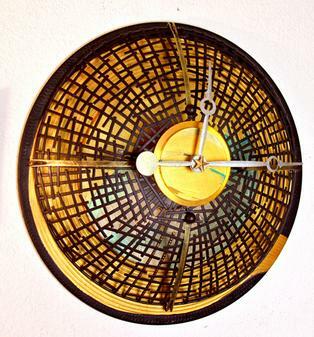 Made from a formed steel grating and other repurposed objects. 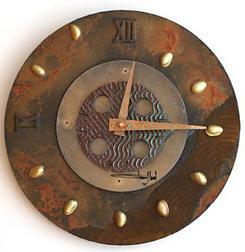 Antique numerals are made from lead and painted copper with an iridescent finish. 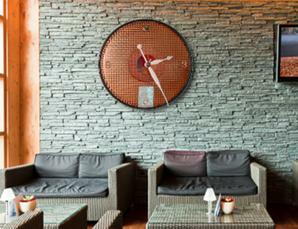 A black surround creates just enough contrast and drama to make the clock stand out from the wall. 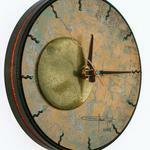 Hour and minute hands are copper patina finished. 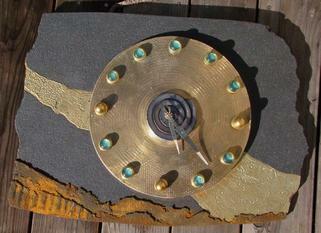 The brass sun at the center rotates. 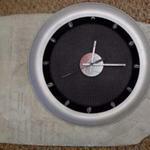 Hour numerals and markers are subject to change on ordered versions. Clocks in this section have already been purchased. 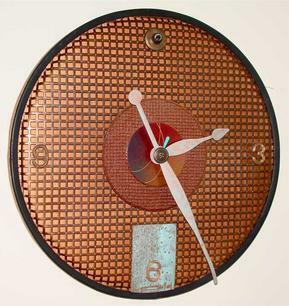 Because each clock contains unique parts and sentimental objects from individual customers, exact duplicates may not be possible. Please contact us to discuss possible variations. We would be happy to hear from you. 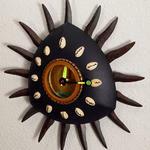 Please call 510.932.6085 or email us at steve@STEVENartclocks.com to order. 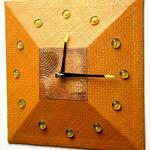 The steel grid pattern of this piece of art is the thing that intrigues everyone. 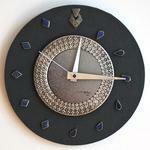 Made from a painted wood base with textured rings and edging. 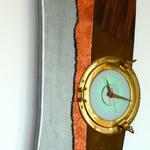 The steel face has lines radiating outward and dancing all across the surface. 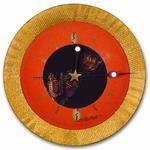 A painted acrylic disc forms the perfect backdrop for a rotating brass star. Hour are indicated with brass bars at the 12:00, 3:00, 6:00 and 9:00 positions. What happened to the circle? This is a step in a different direction for STEVENart Design. 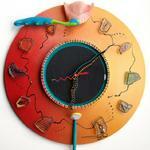 It's a potpourri of different textures merging to become one outrageously elegant clock. 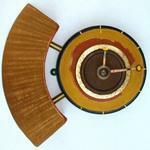 It's made from textured and painted plastic and wood, jewelry, found metal, a brass dish, hardware and jewelry. Contoured hands with unique gray finish and glow in the dark tips make seeing the time easy under various lighting conditions. Inspired by the beautiful woman it's named after, Kumari's Gratitude evokes radiance, energy and a connection to the earth. 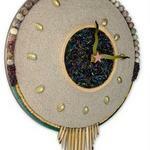 It's made from a base covered with a woven natural fiber, accented with coral beads and other jewelry pieces. It's the first of a new series incorporating abstract paintings and pictures in the center. Edges are enlivened by thousands of dots and lines, applied one at a time--a process that spanned a few days. Glass feathers mark the 3:00, 6:00 and 9:00 hours. 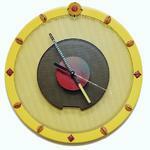 The Sun Goddess line of clocks was developed to satisfy our customers who desire a more affordable STEVENart clock. By eliminating the extra layers and finished backs, we succeeded in doing so. 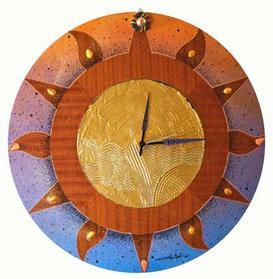 Charged with the energy of the sun, it speaks loudly to your spirit. 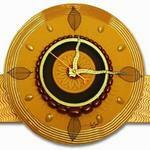 Made from a textured and painted melamine base with an energized crackle-finish center. 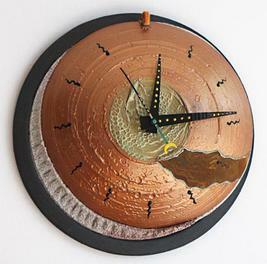 Contoured hour and minute hands glow in the dark for hours after a good charge. 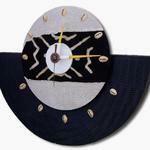 The Sun Goddess line of clocks was developed to satisfy our customers who desire a more affordable STEVENart clock. By eliminating the extra layers and finished backs, we succeeded in doing so. Energized with golden rays, it's a brash statement of majestic beauty and spiritual connection. 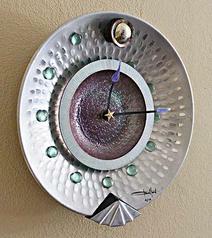 Made from a textured and painted melamine base with dichroic glass beads on a gray, mica-infused center and STEVENart signature spiraling pistachio shells with unique metallic finish.